So we meet again. You might wonder where I disappeared to. I will warn you, it wasn't anywhere a Mom wants to be. I had moved into the restroom to get my son potty trained once and for all. Roo is 4 and a half. Yes, nearly 5 dang years old. He is smart, adorable and I love him, but for two years now I have felt that the pull ups needed to go. But guess what. The #2 situation was another story. He wouldn't. He knew when he had to go. He would change out of his big boy undies and find a pull up or resort to squeezing into his little sisters diapers, he would hide in his room, stinking up the place. Then he would say "Mommy clean me!" I talked to doctors. They all said he will go when he is ready. Encourage him, don't push him. Be patient. Patience... oh, great. I have so much of that! Well anyhow, nearing his 5th birthday, he is officially a potty pooper! Last Saturday I woke up to hear "Oh no Mommy. Uh oh." He looked terrified. I asked him "Roo what is wrong?" He said "Mommy....clean me?" Just waking up I said "You need to potty?" He said no, but I got him into the restroom. Within a few minutes he had completed his task! We were so proud of him! I thought it was a sleepy coincide at first, but sure enough, he has gone to the potty every time he has had to go for 5 days now. I have had to really coax him, as he wants to revert back to a pull up already. But, nonetheless, am one proud Mama! Way to go Roo!! I will be honest, lots and lots of bribery happened. Roo got Frozen on dvd, The small story set for Frozen, hot breadsticks at his request. $1.15 for his bank, all in nickles. He often times will do something like clean off the table for me and say "Want a nickle! I cleaned!" This time it was "Niclkle Please... so we stocked up on nickles, He is still working on that bribe too. We have agreed that if he continues to use the potty next weekend we will go swimming. Bribery... not a single doctor recommended bribery... but it works for me. I am now down to one child needing diaper changes and my 15 month old is interested in the potty too. She will plop her little booty on it and sit to read. I have a hope she will be much easier to potty train. Deary Weary Mom, if your little ones are potty trained Hooray for you! Please leave a comment and tell everyone how you trained for success. 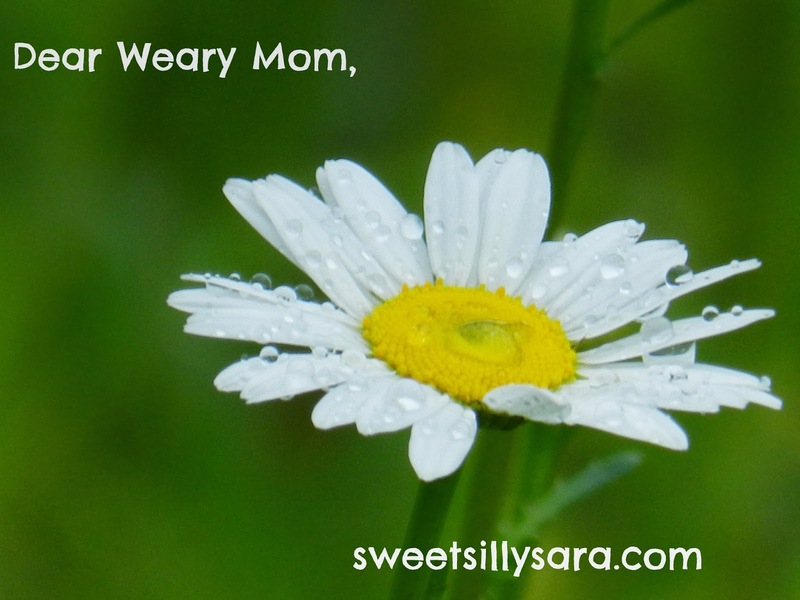 If you are still battling the potty mama, just relax. Someday it will happen. Trust me! my daughter didn't get potty trained until she was almost 5. She also has verbal apraxia and a sensory processing disorder which doesn't help matters. I have had so many people tell me you just have to wait until they are ready. I tried so many other times and she just wasn't ready. So proud of Roo. Yay! Congratulations on success! I know I had a hard time potty training my son, I needed a lot of patience and I am sure I used bribery also. My daughter was much easier. I was also worried about changing diapers when he was in college, but that did not happen! That's great news! I don't remember much about the time frame and my "scrapbook" is more of a scrap pile in a Rubbermaid storage container, but really, what kid is going to want to know how old they were when they mastered #2 on the potty? It does happen when they're ready and bribery is most certainly allowed! Do it while you can because dollars++ don't even work on teenagers (not talking about the potty anymore), at least not mine.